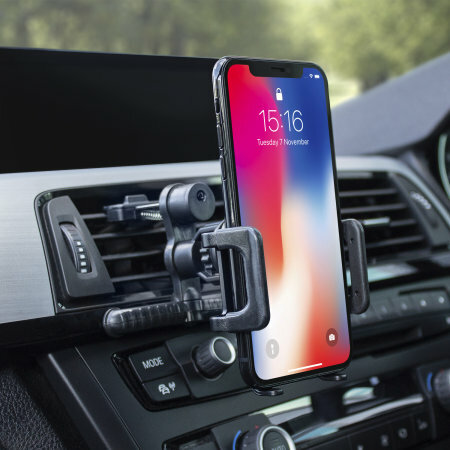 Keep your phone close at hand and safely in view while driving with the Olixar inVent Universal Phone Air Vent Holder. The gripper barely accommodates my Galaxy Notes 9 which has a plastic edge cover. I would have the gripper open a few more millimetres to cope with this. It took me a while to realise that the support pads were folded up for packing and needed to be unscrewed. Nevertheless this product is one of the best vent phone holders I have seen. The holder fell forward onto car floor. Not strong enough to hold a phone. Not fit for purpose. Clip that attaches to vent is so weak it bounces around all over the place. Padding on lower arms doesn't contact dash except on widest spaced setting, meaning I can choose between no lower support, or getting my dash scratched. Phone cradle also has limited range, so cannot get my phone (a Moto G6) in there without first removing my case. Whole thing is both bulky and flimsy. Went in bin within an hour of arriving. Terrible product. Easy to install and looks great, the clip holding the phone could be a bit more smooth removing phone when exiting car, as a bit clumsy and fragile. No instructions in box on how to connect the two pieces (phone holder and airvent attachment). Keep coming apart when attaching phone. Phone sits snuggly into holder and is protected by rubber padding. 1. The product came without assembly instructions. Luckily, my grandson figured it out. 2. The product itself is a big disappointment because it does not latch properly to the vent, which makes it unsteady, rattling, and soon or later the phone will be dislodged. Basically, a cheap, low quality product. It is now in the trunk of my car, most surely never to be used. I ticked above one star because otherwise my review would not get through. My real rating is 0(zero) stars. The holder was too big for the vent....therefore not usable for said use. It was a bogof phone holder and both were taken out of the package before taking to the car and fitting them. Unable to return them because the package had been removed. Disappointed. I would have liked a better description of 6he product. Fit my car, holds phone in place well. Convenient. Like a lot! Sorry to hear about the issues that your are experiencing with this car holder, would it be possible for you to contact our customer service department who will be able to investigate this further for you? /works great as long as the air vent slats are horizontal, but not vertical as there's nothing stopping it moving sideways. whether it was suitable specifically for use with my vehicle. No need for further information. Happy with the product,, simple to install and substantial structure. Despite only fixing at the top the mount feels very secure. Adjustable for good viewing angle. The release catch is quite hard to find but the side grips have just enough give that you can get the phone out quite easily. Probably one of the best in vent holders in the market. I have tried a lot. Air flow is partially blocked but its not too bad and air flow goes around the phone and cools it during summer. Only issue I have is the horizontal width of the clamps doesn't open wide enough. So if you are using a Note 8, it will only work if you are using a very slim case or nothing at all. I bought this for my iPhone 8 Plus and the cradle *barely* fits the phone and a slim Silk case. The holder seems reasonably well built, but I do not like having to force the phone into the cradle. Taking the case off and on each time is not what I had wanted. The holder itself projects quite far away from my Hyundai's vent. The product images do not really capture that characteristic. The result is that the vent is always tilted down. Even with the screen angled as far upward as the holder adjusts, the screen is still tilted slightly downward. Not ideal if you are trying to use the phone for navigation. For my purposes, it simply is not useable; and, I won't be recommending this to others. Bought a similar priced holder from elsewhere awhile back but phone kept dislodging on bumps in gje road. The claw like, soft-grip of this device makes for a very secure hold of your device. It holds the device a few centimetres away from the vent so the air from the vent is not heating the device. Tip: take time to position it; without your phone on it you may think it is a little flimsy but it does the job really well in practice. quite awkward to set in place and moves a bit? This item seems good for a phone. The service from mobile fun has been exemplary. Even responding to my emails on a Sunday afternoon concerning a delivery problem which was NOT caused by mobilefun. The item had been taken in by a neighbour as it had been left in a risky spot by Hermes. Hermes stated on the the delivery slip that it had been left in “porch. I do not have a porch. Could not use as it will not fit correctly in my X-Trail. Phone keeps falling out. Fits into the vent and stays on perfectly, bottom abit stiff to turn at first but eases and remains in place when driving. Phone case fits in perfectly and rotates without a problem. Locks and unlocks at the side enabling the phone to slip out while it still remains firm in the air vent. Please don't assume that it's easy to attach. Some instructions within the packaging would be helpful. Sorry to hear about your problems with this product. There is a video on this products page showing how to use it. If you have any further problems, please contact our customer services. Much better than the windscreen holder. Holds phone still and secure. Great price. This is so easy to use and well thought of device. Decent product but perhaps would be more adaptable if different size fittings for various types of ventilation grills were available! This phone holder is very easy to install. It securely holds the phone with the vent. It also has the mechanism to rotate the phone which is very useful. Having shopped around, I think this provides the best position and height for map navigation. I like that it rotates and tilts using a ball joint and does not use magnets which can mess with your phones electronics. Easily attached and detached. It's a little bulky to put away and the phone grip is a little cheap, but then it's a cheap product and couldn't see anything better on the market for even twice the price. Have used it on a few journeys now and it functions well enough without falling out. Does not obstruct any of my controls as the support bracket holds it away from the vent. Cheap, simple, easy to install! It is easy to fit and holds very steady. I wanted a vent mounted holder so that I could keep my phone cool as it tends to warm up when connected to usb socket in car. I have been looking for a suitable car mobile phone holder. I bought few from the reputable shops but they soon breakdown or could not stick. Being skeptable I watched the video and convinced that it might work and it did what it said. It is very cleverly produced for a reasonable price. I shall recommend for anyone wants to try. This item works really well and does exactly as it is supposed to. Works well on other family members cars - but not on my car! The dash board air vent angles away from the driver by more than the rotating base of the holder - great for the passenger but not so good for the driver. The driver side air vent is hidden by and is too close to the steering wheel. What a great device. I was looking for something that you did not have to stick to your windscreen. When I received the device I was a bit apprehensive weather it would fit in my air vents as mine are quite rounded, and very different to a standard care vent structure. After a bit of readjustment it fit! Love it. Plus you can dismantle easy and store away when I have finished using it. Love it, Happy with it. Rotates very easy without the mobile phone dropping from the grips. Very steady too. I would recommend this item to family and friends. I ordered the phone vent car holder for me to go in our car and my husband loved it so much he's now got it for his van so I've now got to order another one!!! So what can I say - a great little device!! Fits easily into a vent and holds the phone securely. It rattles when the phone is not in it, but that's no big deal! It's a tight fit for bigger phones so check the dimensions per the description before you buy. Works as promised and feels very secure. Well made product which does the job. I would have liked a little more width in the jaws as I have a big phone. Came across this after searching various suppliers. Wanted something with a little bit of style but also some strength as previous ones have been cheap plastic hooks that break easily. This one fits the bill perfectly and would recommend to anyone. Also very reasonable price and with very quick free postage included I couldn't have found a better deal. The Olixar inVent Universal Phone Vent In Car Holder has proved to be very useful for my husband as he goes about his job of work. As he sometimes changes vehicle multiple times in a day, he can move the holder from one vehicle to the next with ease. It has proven to be a great compliment to his portable handsfree kit. Excellent product. Solved the problem of where to put the mobile phone or sat nav in the car. Unbelievably cheap price for what you get. Even can be used as a photograph frame. There is the choice of a desktop phone holder or to fit onto the window screen with a long flexible arm. I use the air vent adapter to plug into the air vents. A word of warning. When you have pushed the adapter prongs through the slots of the air vent, it is nearly impossible to take the phone holder off again. The first one that I bought I broke the prongs and had to buy another. The prongs are the weak part of a strong construction. I liked the way you press a button and the phone grippers open to a generous amount to take many sizes of equipment. In short, a clever well thought out gadget for a fiver. What not to like. Seems stable enough, has good articulation, and doesn't obstruct cables. Vent mount allows positioning closer to car charger and driver than window or dash mount. This holds the iphone in just the right place in our DS4 to enable use as satnav - power lead connects without any difficulty. Clips in to the vent easily and firmly and holds the phone at the angle required for easy viewing. No rattles, no problem - its a great product. Brought the item after reading the reviews saying fits the majority of cars, but not a vauxhall astra. The bar that hooks onto the back of the vent was too long and didn't do the job at all.... Gutted! I needed a mobile holder for my large Motorola Moto X Style and this fitted the bill perfectly. It is genuinely simple to put together and fitted in seconds. Though it sits loose when not in use, it does not flap around as some reviews have suggested. When the phone is inserted it feels solid and can be easily positioned to any angle. The edges of the holder that hold the phone have a rubberised cover to prevent damage to phones. I have a VW Golf and when attached to the air vents in seconds provides a convenient position for the phone allowing easy use but in an unobtrusive position. I bought an in vent mobile phone holder. It is just what I required, as my mobile is a big one and other holders don't open wide enough to hold my phone. I have already used it on a number of occasions, as I find Google maps easier to use than sat nav. The device appears to be well thought out, but no matter where I placed it, on a smaller or larger vent, up high or lower. It would slide and twist. There was no stable position. Once the phone was put in , it did not settle, any turn in the car would have it move and wobble at times. Turning the phone from portrait to landscape would sometimes move the whole device with it. Occasionally when touching the screen the holder would move sideways, it was just a mess at times. Too dangerous to use while driving. I had a similar bracket for a previous phone. The attachment to the air vent and the lower legs is nice and stable (actually better than the old one, despite the similar design). The phone grip is secure and the back plate includes a foam pad so you don't get any annoying vibrations while driving. The only negative is that the locking mechanism on the width adjustment tends to slip to easily when inserting/removing the phone so you have to readjust the width frequently. Would recommend. Haven't used it for long so can't speak to its longevity, but it seems like it will last. Does the job.Pity the bottom clip doesn,t rotate.It only fits onto vertical slats.My vents have horizontal slats,like every other car I have looked at,so the bottom clip just hangs in space,which lets it flop round a bit. I bought this car mount holder for LG G4 and I don't use a case and it keeps falling off. Also, My wife has an iPhone 6s Plus and it can badly go in there. Therefore, I would not buy this for an LG G4 or iPhone 6S Plus. I haven't been able to use it since I bought it. This is really crap for the price when there are better holders out there for the same price. Provides hands free access for mobile too. This product works great, provided the measurements fit your car's vent system. It does flop around slightly, but not enough to send the phone falling, as some buyers complain. I use it for an Ipod, and it makes it easy to see which track is playing, and easy to manage playback controls. It was well worth the money. Great product which keeps the iPhone close by but does not obstruct vision. With the 6s plus it is a tight fit but no concerns with it falling out. Yes, I would suggest your product to a friend. My two other car vent GPS holders are difficult to uninstall. No such problem with the Olixar Invent Car Holder. The spring attachment mechanism is easily removed for out of sight storage or transfer to another car. The holder itself expands to carefully and firmly hold my Moto E (2nd Gen) smartphone. The side holding bars do not interfere with the on/off switch or volume up/down bar. There is a “gap” in the bottom support bar for the smartphone power cord. I have just two minor criticisms. I would have preferred some rudimentary instructions. The unit comes pre-positioned for attachment to vertical air flow vent vanes. You need a small Phillips screwdriver to loosen the screw to gently rotate the attachment arm into the horizontal position and then snug up the screw. Secondly, the side holding arms are very stiff so care must be taken when pulling them open to accommodate a wider smartphone. Once properly sized, the Olixar unit holds the cell phone firmly in place but still allows the phone to be easily slipped out when leaving the car. Overall, an excellent product at a very fair price. This product may not work with all makes and models, but it did work well in our car. It did not flop around as other customers complain about, and it did hold my Ipod classic securely in place. Plus, the purchase price made it a low risk experiment. I'm glad that I got it, cause now I'm gonna hang onto it, and it'll make our media center in the car more useful. When I took this out of the box I have to admit I was a little worried. It seemed very floppy and I could not see how it was going to be firm enough to hold a phone properly. We have a Fiat Panda, whose vents are curved in two dimensions and really not easy to fix anything to. I eventually managed to fix the holder into the small side window vent on the right hand side of the dash and even then it still seemed very loose. However, as soon as you put a phone into it, it somehow manages to become very stable! I still do not fully understand it but it works brilliantly. The location is also good - right next to your right hand (so you can make the occasional screen tap - when you are stationary!) and it is not so low that you have to move your eyes a long way off the windscreen. I bought a dash holder because an AA man told me that it is illegal to have anything attached to your windscreen within the sweep area of the wipers. It is A good designed phone holder. But for smaller phones only. It can not hold A bigger phone like Samsung Galaxy note. This mobile phone holder kind of does what its supposed to but its not very good. It doesn't hold my phone straight (Sony Xperia Z2) and annoyingly the holder comes in two parts and the front part that the phone sits in doesn't connect securely to the part that connects to the car aircon. So if you go over any big bumps or around a sharp corner it can come apart and fall off. I might try superglueing the two parts together so this doesn't happen. In hindsight if I knew there was a more reliable holder that would definitely fit my phone and car I would have paid more for it, but I wasn't sure if it would fit my car or phone so didn't want to spend too much on it. Very good at holding phone, would buy from them again. This item is the only item that I have bought from Mobilfun that has turned out to be a load of rubbish. It is so flimsy that it rattles when no instrument is inserted and then when one is placed, it just flops down and is not viewable. The retaining spring is so weak that it is incapable of staying in place. Definetly a dustbin job. Shipping was very quick and reasonable. The Olixar In Vent Phone Holder works great on my wife's iPhone 6S and also on my iPhone 5 with an Otter box cover. The holder fits nicely in the vent of my wife's 2014 GMC Acadia. I would highly recommend the holder. I'm going to order one as a gift for myself. I've tried several phone holders in the past but this one really works holding the phone in an ideal accessable and visible position. It's easy to install and remove if necessary and very simple to fit and remove my phone. Very good product, well described as per product specification. The price is very competitive. This is a doodle to fit (and remove) from any ventilation grille and holds the phone firmly. Being offset from the grille means you don't cook your phone when you have the heating on as well. Very easy to adjust the orientation of the device to suit how is best for you. It comes at a good price and is fitted in a moment so what's not to like? I have been looking everywhere for something like this.I have a Galaxy S5 with cover. The arms don't seem strong enough or deep enough to hold the phone I place. They keep sliding apart or the phone just falls out. I have horizontal vents, which I thought would have been ideal for the holder. The idea is a good one, just not for me. Whilst the holder's vent attachment mechanism is quite clever, the arms for the phone are not. The arms that hold the phone in place are ratcheted to allow for different sized phones, but this easily undoes letting the phone fall out. Additionally the shaping of the arms means they don't hold a phone with a case very well as they don't allow for an appropriate depth.